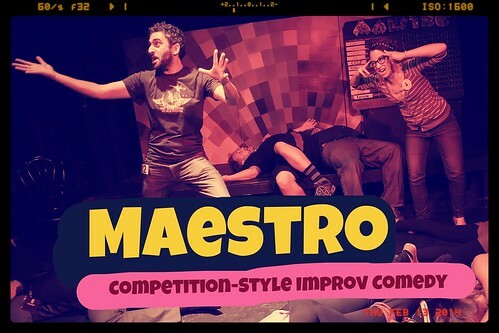 Every Saturday at 10:00 the Hideout presents twelve of Austin’s virtuoso improv comedians for a night of games and scenes based on audience suggestions — but only one of them will make it to the end of the show and be crowned MAESTRO for the week and awarded the coveted Canadian five-dollar bill. If you’ve never seen improv comedy at the Hideout, this is the show to catch. Maestro sells out most weeks, so get your tickets online! Also, most Maestro shows are now wheelchair accessible as they are performed in the ground floor theater. To guarantee a space ahead of time e-mail Artistic Director Roy Janik at roy@hideouttheatre.com.